When asked about her philosophy on life, she replied: “Give it your all in the time that you’re given.” And that she has done. 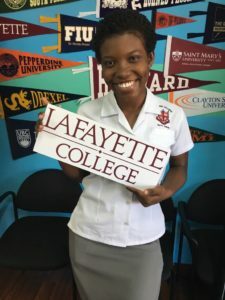 Shantae Shand, a 13th grade student at Campion College, will officially be attending Lafayette College, a prestigious liberal arts institution in the United States. But the journey was anything but easy. She remembers storming up creative ways to cover her tuition at Campion. Not only did her parents and guidance counsellors contribute to the tuition and expenses, but she also used the prize money, which she won from various essay competitions, to contribute towards her school expenses. Often, Ms. Rose, the guidance counsellor would also support her by providing lunch money. “I have done a lot of work on my own using the resources that are available to me. She played netball and basketball and was very involved in debating and beauty pageants. In fact, she entered (and was crowned) Miss Campionite in 2016, and also entered Miss Teen Portmore and Miss Omni-Star. She also served on the board of the National Secondary Students’ Council as the Public Relations Officer. She stays involved because she loves meeting new people. In August of 2018, Shantae will begin her collegiate journey, aiming to pursue two bachelor’s degrees in International Relations and Civil Engineering. She is quite excited for her journey, and is already looking forward to life after college and thinking about the kind of service and activism work she would like to do to give back to those in need. “I want to do good and look good!” she chuckled half-jokingly. We wish her all the best. Hey Buddy!, I found this information for you: "HER Story: 2018 AIM Higher Foundation Scholar, Shantae Shand". Here is the website link: http://www.aimeduservices.com/uncategorized/story-2018-aim-higher-foundation-scholar-shantae-shand. Thank you.